As long as the top card of your library is a creature card, Mul Daya Channelers gets +3/+3. 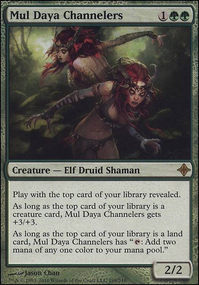 As long as the top card of your library is a land card, Mul Daya Channelers has "Tap: Add two mana of any one color to your mana pool." Thanks for taking a minute to make suggestions. 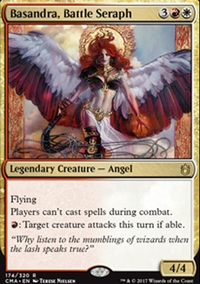 I agree Celestial Archon is not good, too much cmc. Boon Satyr I'm always on the fence about, I feel like it could be useful, but it honestly never seems to make a difference in the outcome of the game. Vizier of the Menagerie I feel could be useful though, I have a lot of other cards that manipulate the top of my library, Mirri's Guile , Courser of Kruphix , Mul Daya Channelers , Sylvan Library , and if I don't like what I see there, I use a fetch land or something to shuffle the deck. hkhssweiss on Tasigur's Combo Buddies!!!! The reason for the changes above is that I noticed for the IsoRev combo, you don't run the unfair mana rocks so getting it to trigger +3 or more mana early game is quite difficult which is why more dorks may be needed. Animate Dead is awkward unless you want to use it to steal other people's shenanigans, but as of now doesn't further your gameplans. Joiner Adept is okay, but doesn't ramp you and fixing mana base isn't too bad when you have dorks. Utopia Sprawl is awkward when you don't have a developed mana base so getting it on a forest is a bit harder, Wild Growth makes a decent change until you have access to fetches and duals. 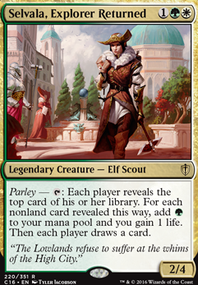 Solemn is usually alright, but with no outlet to constantly draw cards, Windfall would be a tad bit better to fill your grave for delve as well as hand disruption and CA. I am a bit iffy on Mul Daya Channelers but I can see why it's in there. I just don't like revealing the top card of the library if there is no additional effect that digs you deeper like for ex. 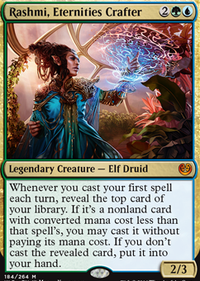 Oracle of Mul Daya or Vizier of the Menagerie. If you do switch it out you can use that as a flex spot for more tutors or maybe Green Sun's Zenith/Diabolic Intent. Aside from that, whether or not it's worth buying is dependent on you. If you love the deck than of course! Imo, when you own the deck and spend the time revising and making it the best to suit your style of play, that's when the true value of the deck comes forth. I have been playing my Teneb and Intet deck since I got into EDH over 4 years ago, they had gone over more than 20 iterations but the journey and memories there are irreplaceable to me and was well worth it. Thanks for your help, GoldenMunchkin but I think I'll stick to Mul Daya Channelers and Oasis Ritualist. I'd rather have a reliable combo than a fast one. Super excited for the Esper deck, but I'm not sure how much support the deck has. Without much support it'll probably feel a bit bad. Blue has Future Sight and Magus of the Future, but idk what else. "Top of deck matters" feels a lot more Simic than Esper because of Garruk's Horde, Mul Daya Channelers, Courser of Kruphix, Momir Vig, Simic Visionary, Oracle of Mul Daya, etc. Your deck is all over the place, so it's really hard to give suggestions. 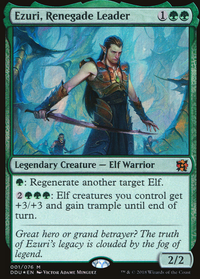 It would all work a lot better (and be easier to give advice) if you'd focus on one thing: aggro, stompy (big creatures), ramp, some sort of creature value deck (that's the vibe I got from Cream of the Crop and the mainboard Reclamation Sage), etc. As it is right now, there are too many 2-ofs that are trying to do different things for me to really know what to focus on. But the general advice that I can give you is that your deck is far too slow for modern. The goal is to consistently kill your opponent by turn 4 or be capable of stalling the game until you can kill them. 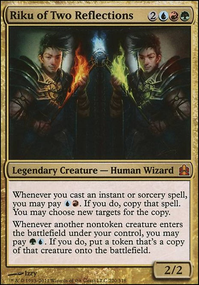 Judging by your hubs you want an aggro deck, so probably make the goal to win by turn 4, and cut cards accordingly; without any ramp spells, I suggest cutting any creature over 4 mana and only having a few that are 4 mana. If you want help focusing your deck once you decide on what you want to go for, feel free to ask me for help and I'll suggest some cards. I'm pretty good at that type of stuff.